Though normally a highly sociable bird species, we learn that one handsome specimen of gannet called Nigel passed away happily at a ripe old age, surrounded by friends but sadly possibly on the cusps of something big that would have remedied what some are describing as terminal loneliness and would have certainly stripped him of his nickname of “No Mates Nigel.” Conservationists in New Zealand wanted to reintroduce seabirds to Mana Island and in order to signal to passing flocks that it was safe to nest here (invasive species that might prey on hatchlings were removed from the island), they installed an ensemble of concrete, decoy gannets. Only Nigel alighted, however, in 2013 and became besotted with one particular stone figure which he courted (either to his great frustration or contentment—it’s hard to say) for the next five years. 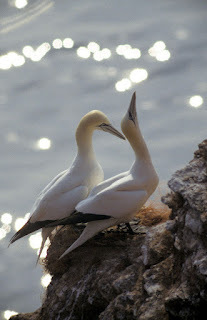 In February, Nigel’s body was found next to his beloved, just as more live gannets had begun to investigate the island.